Consensus rules the Arms Trade Treaty. Or does it? The recent adoption of a United Nations resolution to produce legally binding international standards for the transfer of conventional arms is a real boost to the cause of international peace and security. Overwhelming support in the First Committee of the UN General Assembly for the negotiation of these new rules has set the scene for a series of preparatory meetings leading to the convening in 2012 of the United Nations Conference on the Arms Trade Treaty. This is an important development on at least three levels. First, it surely reflects the international community’s new-found urgency for pursuing arms control, disarmament and non-proliferation initiatives. It follows hard on the heels of the Cluster Munitions Convention adopted in 2008. Russia and the United States in the meantime are negotiating radical cuts to their nuclear arsenals. Efforts are intensifying to resolve long-standing nuclear weapons differences with Iran and North Korea. Nations of Africa have just brought into force the Pelindaba Treaty, significantly increasing the nuclear-weapon-free areas of the world. And the Conference on Disarmament (CD) is on the threshold of pursuing, alongside other major issues, a global ban on the production of fissile materials, the essential ingredient of nuclear warheads. The Arms Trade Treaty has thus clearly caught the mood. More significant – and this is the second level on which the resolution is so important – is the intrinsic worth of this initiative. 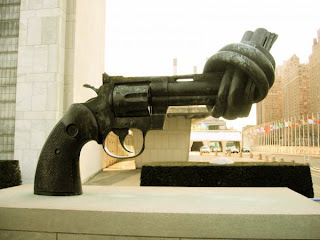 As proponents of an arms trade treaty have made clear, with hundreds of thousands of people dying each year from armed violence “Governments must ensure that negotiations live up to the promise of setting the highest possible standards”. This leads directly to the third noteworthy aspect of this development. The terms of the resolution require the 2012 Conference to achieve a strong and robust treaty “on the basis of consensus”. Are these aspirations contradictory? Is it impossible to live up to the “promise of setting the highest possible standards” if governments are only allowing themselves to reach an outcome to which none of them objects? Is this a prescription for a lowest common denominator outcome, rather than a strong and robust treaty? The answer to these questions must, for the sake of all the victims of inadequate arms transfer controls and in the interest of sustaining the current global arms control and disarmament momentum, be a resounding “no”. The fateful words “on the basis of consensus” should be interpreted with circumspection. First, the rules of procedure of the 2012 Conference are yet to be drafted, let alone adopted. Second, the phrase “on the basis of consensus” cannot and must not be equated with, for example, the consensus rule in the CD’s rules of procedure which state baldly and without qualification that that body will “adopt its decisions by consensus”. If the phrase in question does not mean the automatic application of the notion that the eventual draft of the Arms Trade Treaty will be adopted only if no State voices an objection to the text (and thus without voting), what does it mean? This remains to be settled by the governments that will participate in the elaboration of the new treaty under United Nations auspices. The Law of the Sea approach is the classic way of proceeding “on the basis of consensus”. Voting is a last resort. But it is not foreclosed. Even the UN Standard Rules of Procedure for UN Conferences envisage the possibility of a vote (Rule 51). And, to give a more recent example, the Rules of Procedure for the UN Conference on the Establishment of an International Criminal Court make it clear that if "in the consideration of any matter of substance, all feasible efforts to reach general agreement have failed, the President of the Conference shall consult the General Committee and recommend the steps to be taken, which may include the matter being put to the vote" (Rule 34.2). Let’s not beat about the bush. Some governments prefer outcomes that they see as being representative of the breadth of views in the international community, while others regard them as watered down outcomes. This is the quantitative approach: lower standards but with more adherents. It is the dichotomy represented on the one hand by the efforts of the parties to the Certain Conventional Weapons Convention (CCW) in dealing with landmines and cluster munitions, and on the other by the Ottawa and Oslo processes which have surpassed the CCW in terms of imposing higher standards - the qualitative approach. With at least a third of a million people killed directly with conventional weapons and many more injured, abused, forcibly displaced and bereaved as a result of armed violence every year, the negotiators of the Arms Trade Treaty will surely be aspiring, as their recent decision envisages, to the highest possible common standards for regulating the transfer of conventional arms. It is to be hoped that as the work intensifies the negotiators will drive the process in an enlightened manner, taking along as many governments as possible but without succumbing to the tyranny of the minority. This is a guest post by Tim Caughley. Tim is a Resident Senior Fellow at UNIDIR.